Herm is a small island with outstanding natural beauty, where you'll fine this cosy pub and hotel. Herm Island is 3 miles from the coast of Guernsey and measures just a mile and a half long and half a mile wide. Herm is the perfect place to stay for a truly relaxing channel island holiday and is ideal for families and anyone wanting to "get away from it all". Once on this paradise island enjoy the beautiful, unspoilt beaches and safe, clean pollution-free environment. Turquoise blue water gently laps the glistening white sand, allowing you to build sandcastles and paddle in the sea. There are no cars, no crowds and definitely no stress. Explore off the beaten track and you will find a private spot, even in the height of summer. Go crabbing, rock pooling and snorkelling or just relax with a good book. Nestled atop the cliffs of the beautiful island of Herm, The White House is the island's only hotel and the perfect place to unwind in style. The hotel is just a short walk to the beautiful shell beach and has spectacular views out to sea. Boasting old fashioned elegance and timeless charm, the bedrooms are located in pastel coloured cottages associated with the main hotel and envelop you in their warm friendly atmosphere. There are no TVs or telephones allowing you to really escape from the hustle and bustle of daily life and enjoy Herm the way it was intended. Take a walk around the island enjoying the views of large green fields and a striking coastline then retreat to this traditionally comfortable hotel to unwind at the end of the day. Facilities include an outdoor swimming pool, a cosy lounge, a bar and a restaurant. This offer is based on a stay in a Cottage Room. These luxurious rooms are furnished with elegant décor and neutral colours, enveloping guests in the tranquillity for which the island is famous. 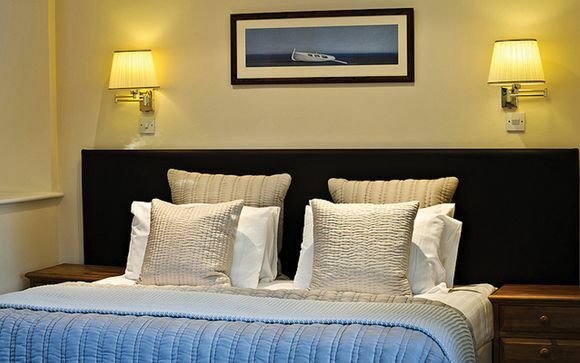 Cottage Room - these beautiful guest rooms are situated in the cottage adjacent to the hotel. This is based on a bed & breakfast stay. Those who are staying in April, May & June will receive complimentary half board basis (breakfast and dinner in the main restaurant - excludes drinks). Whether you come across on your own or as part of a group you will find that Herm's restaurants and cafes have something to suit everyone. Whether you just want a sandwich while sitting on the beach enjoying the sun or a formal meal with silver-service in our excellent hotel, you can find it all on Herm. An extremely popular restaurant with our visitors, you are invited to sit out and enjoy drinks and lunch on the patio, sit in either the bar with its open fire or in the restaurant area for some delicious food. This AA Two Rosette restaurant offers first class dining with the freshest fish and shellfish, where local produce is used wherever possible. The Hotel has one of the most extensive wine lists in the Channel Islands. The Mermaid Tavern was named after an old cargo vessel used many years ago to carry supplies to the island. Originally a fisherman's pub, The Mermaid is now the social centre of the island. Its cheerful informal atmosphere is popular all year round, especially in the busy summer months when it is open daily. The grill room at the Mermaid Tavern has an informal casual dining style that features heavily on steaks, but also offers some wonderful fish and vegetarian dishes. Herm Island offers visitors a delightful variety of coastline where you can spend time relaxing and playing on the beautiful beaches, swim in the turquoise blue waters, explore the grounds, go crabbing, snorkel, kayak, charter a boat, go fishing or take part in a tour where you can learn about the history of the island’s legends, murders and ghostly sightings. Flights: Return flights to Guernsey are included from various airports, details of which can be found here. Shared ferry transfers are included in this offer. 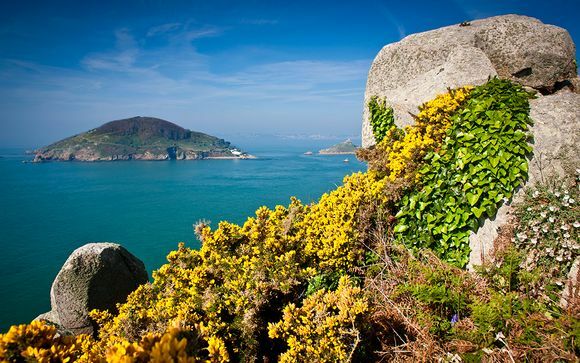 This includes land transfers from Guernsey airport to the ferry terminal. 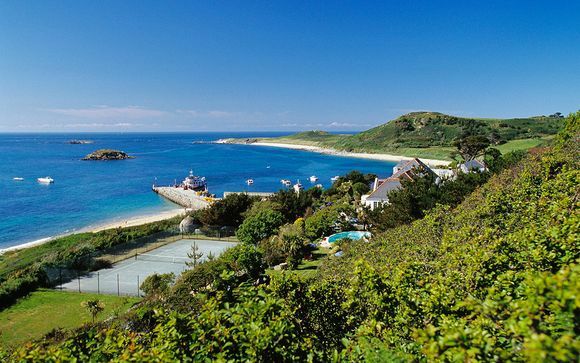 There are no transfers included in Herm since it is a very short walking distance away from the hotel. Transfer distance is approximately 10km. Please do make sure that you add Voyage Privé to your Safe Senders list and check your Junk mail regularly for your travel documents.